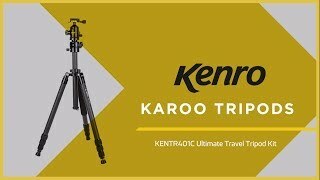 The Karoo® Travel Tripod Kit 401 is manufactured from high quality aluminium alloy – making it light at 2.15kg but durable, as well as stable in use with an impressive load capacity of 10kg. It has won numerous industry awards, including most recently the Digital Camera 2018 award for best aluminium tripod. The 401 is a compact tripod packed with a host of unique features as standard. The centre column has an easy ball-action movement which converts it from vertical to horizontal mode, plus a 360 degree smooth panning action. Other features include a detachable leg which converts to a full size monopod with standard and short centre columns supplied. 7. Handgrip: Supplied with a comfortable padded handgrip.